It is with heavy heart and great love and affection that we mark the passing of a wonderful woman, a great theatre practitioner and a Theatresports legend. On the evening of March 29th, Barbara Williams, aged 67, succumbed to liver cancer in her Sunshine Coast home, leaving behind her loving partner, Anita Freed. For those who never had the good fortune of knowing Barb, she was the Theatresports lighting designer for all our big shows at the Enmore Theatre – and the Opera House Concert Hall – from the early days back in the 1980’s, right up to a few years ago when she moved to the Sunshine Coast. She was brilliant, formidable, tough and funny, with a heart as big as a house. She was also an Artist, in the truest sense of the word. She didn’t just light shows, she created beauty and magic on stage. When she lit a show I couldn’t wait to see what she would do. She never failed to take my breath away. I was lucky enough to meet Barb when I was 19 years old. A mutual friend of ours, the late, great performer Michael Matou, introduced me to Barb at the fabled Les Girls Club in Kings Cross. Barb was tucked away in a tiny booth, operating the lights for the superbly glamorous drag show. It was old desk, with big manual levers and she was literally dancing over the desk in a frenzy, following every movement and beat, creating lighting effects that decades later would be done with computers. She was awesome! I met her again years later at Belvoir St Theatre in the 90’s. She was the Production Manager at Belvoir St Theatre, and Theatresports was the weekly Sunday night show in the Upstairs theatre. With all the major productions that graced that wonderful theatre, she could have largely ignored us. Instead, she became a member of the team, going out of her way to look after us and accommodate our crazy shows. 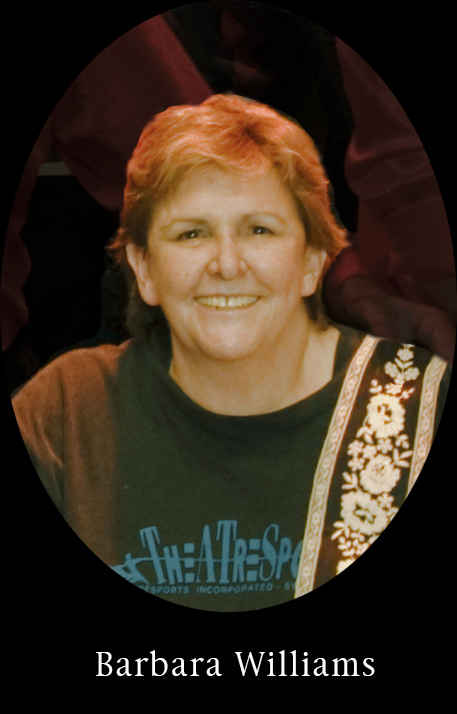 She became our go-to super-professional and she worked with all of us at Theatresports for decades. Everyone who met her and worked with her will remember her. I’m sure I speak for everyone when I say that getting Barb’s acknowledgement and respect was a big deal: she was the real deal. She was Theatre with a capital T.
Barb worked for so many years as a top lighting designer and production manager, from Belvoir St to the Opera House to Century Venues and Mardi Gras and more. There are so many people who are mourning her passing, and reminiscing and sharing their great Barb Williams stories. From all of us who have been part of the Theatresports journey since 1985, we pay our deepest respects to a wonderful artist and a beautiful person. We send our heartfelt condolences to her family and friends, and in particular to her loving partner, Anita Freed, who was there with Barb until the end. She loved Theatresports. She embraced the vibrancy, speed, inspired wit and mayhem. She met the challenge every time. She improvised with us. She was responsible for unforgettable, brilliant lighting for many of our biggest shows for 25 years. A wake to celebrate The Life and Work Of Barbara Williams is being planned for late May. Venue, Date and Time will be available over the next few weeks when her Sydney Gang finalise the details. All those who loved, knew and worked with her are welcome.